I’ve been pondering my dependence on petroleum lately – more specifically, gasoline. When I think of plastics and how many of them are essential to daily life, I get a little woozy. When I think of gasoline, I immediately think two thoughts: I am American; I use way too much gasoline. The two seem almost synonymous in the headlines these days. Everyone else seems to do a better job of resisting the lure of convenience that gasoline brings. During my pondering, I realized that my dependence has reached two peaks in my life so far. First, as a college student, I’m certain the fuel I burned driving to and from rivers to go kayaking could have powered a third-world village for a year. Secondly, some years later, I wound up working as a wildland firefighter, and for five years I made regular commutes of up to an hour a day each way. When I quit my job, and my commute, I loved the fact that I went from filling up once a week to once a month. Once a month! Man, that felt great! But, I realize I can do better. I can extract myself a little further from this love affair with petroleum that isn’t great for politics, the environment, my pocketbook…etc. It’s a no-brainer. EVERYBODY knows we need to use less gas. Even if all the conspiracy peak-oil theories are wrong, even if global warming is a sham, even if going green is just the next marketing buzz word meant to strip our wallets and fill our lives with even more junk because the old junk was eco-unfriendly, EVERYBODY knows that excessive driving is just… excessive. And, as my granny (and probably yours, too) would say: Waste not, want not. So, since I just filled up my gas tank yesterday with a grand total of $58.89 worth of gasoline, I’ve decided to see just how long it will last me. 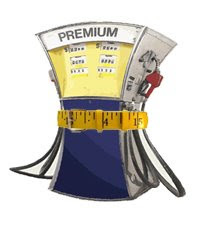 My very own gasoline challenge is to make it two months without filling my tank, cutting my current use rate in half. True, I’m picking the summer months because it’s easier than winter. And true, I live in a town that’s quite conducive to biking and walking. And, I don’t have kids who need to be driven from one summer activity to another. But that’s the point! I have all of these circumstances that would obviously yield less gas consumption, yet I need to do more. A lot more. Since it’s my own challenge, I’m making up the rules. 1) I do not have to buy groceries on my bicycle. I will carpool when there are big groce-runs to make, and bike when I need something small. 2) I have one backpacking trip planned this summer, and I’m pretty sure the handyman will drive us to the trailhead (at least he’ll have to now.) I have no way to calculate that in and somehow siphon half the gas used on the trip from my tank, so I’m simply confessing that I’m not cutting out all indulgences completely. 3) I’m going to be totally cheesy and call it my gaso-lean challenge. I guess since I’ll have to walk and bike more, I might be able to expect some “leanness” happening. And I won’t lie, burning more calories so I can eat more ice cream is always very exciting. 4) I vow to encourage anyone who wants to do this with me. The reason I’m calling it “My Very Own Gaso-lean Challenge” is because everyone’s needs are different. The point, for me, is to do more than I’m currently doing, and this way, I feel like the world might be watching… So I’d better be good. For someone else, three weeks might be a really big stretch and a good commitment to make. 5) Whether I make it or not, when I get to the point where my little Subie says “50 miles till empty,” I stop. It will drive my parents batty when they realize I’m purposely trying not to fill my gas tank, and I’ve already given them my fair share of their gray hairs – quite a few more, I suspect, than my sister. I know they’ll feel a little funny about this challenge because ever since I moved out of the house (over ten years ago), conversations have always ended with, “Be safe!” quickly followed by, “Be sure to fill up with gas!” Every single conversation. 6) I’ll update my running count in the sidebar every couple of days. I haven’t figured out how to get one of those countdown or countup thingies, so the manual update will have to do. So that’s that. Wish me luck and leanness! Wow! Two months, If I can do two weeks that is an amazing accomplishment. I'll be looking forward to your progress. Holy crap, woman! That's a big challenge to go 2 months on 1 tank. I will be watching to see how it goes!! Good luck! Good luck! I'll be keeping tabs :) My husband and I carpool, and, try walking places when we can. It's HARD!!! I applaud your efforts. If we could all just take little steps, it'd make a HUGE difference! Good luck!